Silver Hair Dye There are 17 products. It is so easy to make an impression by trying a head turning shade of platinum hair color! Platinum is a sure way to jazz up your look and is available online from platinum silver hair color to extreme platinum hair dye; it is the perfect color for adding a splash of fun and glamour to your look! Why Should You Opt for Platinum Hairstyles? Today, platinum silver hair is one of the most on trend hair colors which has been splashed through the media by a variety of celebs and personalities. Platinum is such a beautiful and feminine color, that can brighten up a full head of hair, but can also be the ideal way to make a change from blonde hair for a special occasion or just for fun! With a variety of shades to choose from online, including shades of platinum grey hair, platinum silver hair dye and extreme platinum hair dye, platinum hairstyles have been made famous by stars such as Jennifer Lawrence and Kim Kardashian, but also through the hit TV series Game of Thrones. With a softness and femininity that you just cannot find with darker hair colors, it’s no wonder why platinum hair shades are still as popular as they were in the time of Marilyn Monroe! Whether you are leaning toward a block of solid platinum color, streaks or pretty highlights, platinum silver hair is a sure way to impress and to make a change from your regular blonde color or to completely change it up for an entirely new and daring look! No matter what your skin tone, a platinum shade is sure to bring out your party side. Platinum is one of the most popular hair dye shades on the market, and the color itself has many connotations with beauty, femininity and sexiness. Whether you’re looking for platinum silver hair dye to suit your fair skin or dark skin, you will no doubt find your shade at Dye My Hair. Which Shade of Platinum Hair Color Will Work For You? With such an exceptional range of semi-permanent platinum and silver hair color available, you do not need to search through the stores for the best platinum hair color on the market, we have got it all here for you, at prices that won't break the bank! Achieving and maintaining a complete platinum hair dye look on dark hair can be a bit of a struggle if you don't follow the right steps; it’s certainly an exceptional look for those of you willing to work for it! If you are ready to rock platinum silver hair, we have compiled a few handy tips for making the color work for you. Preparation – when dying your hair an intensely light color such as platinum or blonde, which involves bleaching, it is important to protect the impact the color will have on your hair through thorough conditioning and strengthening. The bleach may weaken the hair, so it is important to use keratin and protein-based products as part of your preparation. You have even want to have a haircut to trim any split ends before bleaching your hair. Bleaching – lightening your hair creates a blank canvas on which the colored dye can be more easily applied than to dark. It is desirable to lighten hair to a level 9-10 to ensure your natural hair color does not impact the results of the shade if you are looking for a more silvery or grey end result. Make sure to do your research before coloring and test the bleach product on your skin before a full head application. Toning – using a hair toner is a great way of removing any residual brassiness from your hair color. Using toner products ensures your chosen color ends up the way you want them, without any stubborn underlying tones – we want your new platinum hair tone to look its best! After this process, it is completely up to you how you put on your hair dye. Before you begin applying your dye, it is essential to test possible shades for at least 48 hours. 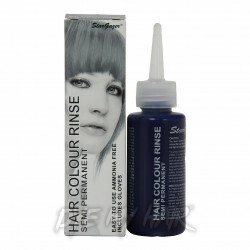 This ensures that you are happy with the color before you cover your head in semi-permanent platinum hair dye and gives you the time to change to a different shade. Are you looking to achieve that salon quality finish from home? Have you always longed to rock the sophisticated and stylish tones of gray hair dye? If so, then now’s the perfect time to switch up your style in a funky and alternative manner! Say goodbye to those boring, dull tones and embrace the classic color of gray hair dye! Boasting a silky and smooth finish, our extensive range of gray hair dye is sure to leave everyone complimenting your style wherever you go! Silver doesn’t just come with age, there’s never been a better time than now to achieve those luscious locks you’ve been dreaming of! Achieving the best silver hair dye color has never been easier than with Dye My Hair! Whatever tone or hue you’re after, you’re sure to find the perfect dye to match. Boasting popularity with celebrities such as Kelly Osbourne and Zayn Malik, there’s no reason why you shouldn’t embrace this funky tone! Proving popular for gray hair dye men or women, this is a style everyone can enjoy. Adding that special something to your style, gray will automatically give your style that sharp, edgy and punky finish you’ve been searching for. Although gray hairs are meant to be a sign of stress, you can rest assured that dyeing your hair a silvery gray hue is far from stressful! An ideal shade for those seeking something a little different, a switch to this metallic tone is enough to get heads turning in your direction! Although known to be an achromatic color, choosing gray hair dye is sure to make your style stand out! With its shimmering finish, your style will no doubt benefit from the uplifting tones! With a wide selection of temporary and semi-permanent dyes available here at Dye My Hair, there’s no reason why your style should be stuck in second gear! 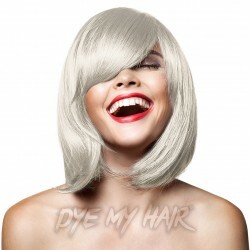 Fast track along the grayscale and liven up your look today with gray hair dye UK! Whether you’re new to the dyeing process or are a hair dye veteran, there’s never been a better time than now to embrace your new semi-permanent silver hair dye! Regardless of your natural hair color, dyeing your hair has never been easier. As is common when dyeing darker shades of hair, it’s often suggested that a pre-lightening solution is used to ensure that your new shade stays as vibrant as possible, especially if you are using gray hair dye for black hair! This bleaching process may need to be repeated a number of times depending on the hue of your natural hair, purely to ensure that the ‘blank canvas stage’ is suitable enough to soak up all those wicked and vivid new gray tones! We recommend that you aim to get your luscious locks to a lightness shade of 9-10. Similar to tones such as white, it’s highly recommended that you bleach your hair to as light a shade as possible. This will ensure that you’re not disappointed with the outcome and that your newly dyed style can stay rocking its vibrancy for longer! You could also add some silver hair toner to ensure you don’t get any unwanted tones peeking through your new color. From shampoo types to hair maintenance, here at Dye My Hair we know how important the small things are when it comes to maintaining your newly dyed locks! We’ve compiled some top tips to help you ensure your newly dyed Silver Gray locks stay shimmering for longer. Always make sure you perform a patch test of your hair dye. Typically performed at least 48 hours before going for full coverage, this process will help you figure out how the outcome will look and whether the dye is suitable for your existing shade. Remember all gray hair dye brands will be different. Make sure you understand all the instructions provided before you take the plunge! By reading the supplied instructions you’ll be able to answer all those pressing Q and A’s before you dive into the dyeing! Before you reach for the dye, we highly recommend that you maintain the condition of your hair to the best possible degree. From brushing to styling, it’s important that your hair is in tip-top condition before you start the bleach/dyeing process. Similarly, if you’re thinking of totally changing your look, with a new haircut as well as tone, we highly recommend that you tackle the chop beforehand. This’ll ensure your style is all ready to go before the dyeing stage. Always have more dye than is needed! Trust us, there’s really nothing worse than getting halfway through a dye job and running out of dye! Always be prepared! Always ask for advice where possible! Double check guides, ask friends or take advice from your hairdresser or stylist. Depending on the product you use the results could be permanent, so make sure you are fully prepared for the process before getting underway. With a wide range of big name brands to choose from, including La Riche Directions and Crazy Color, there’s sure to be a stylish shade to match your needs from Dye My Hair! Kiss goodbye to those boring hues, it’s time to embrace the Silver sensation and treat your style to a show-stopping makeover today! Find your favourite shade from dark gray hair dye to light silver. With an extensive range of silver hair dye suggestions, you’ll be switching up your shade faster than you can say ‘Dye My Hair’! At first, it probably seems a little odd that you can dye your hair gray when so many of us are dying our hair to avoid gray… but when you see someone who’s really pulled off the dark gray hair dye look, you’ll understand. Dark coal blacks lifted with slivers of gray and very pale, cold platinum blondes deepened by silver highlights are very fashionable right now. They’re also very easy to wear with all your clothes and suit most complexions. Tell your granny it’s ok to be gray and dive into the trend yourself. Here we’ve compiled a comprehensive guide to dark gray hair dye, beginning with style icons who’ve dyed their hair, delving through the not-quite-50 shades of gray hair dye from leading brands and ending on a fool-proof method to dying your own hair at home! Dascha Polanco, the actress who starred in Orange is the New Black has dyed her long, dark locks with dark gray hair dye color. By starting with dark gray hair color, dyed using the best gray hair dye available at Dye My Hair, you can add light silver highlights and a touch of lavender hair dye to create a beautiful, unique ombre look like Dascha. Nicole Richie, childhood friend to Paris Hilton, model, fashion designer and TV personality has dyed her hair a light silver gray in the past. She cut her hair style short and natural, styling it in loose waves pointing upwards. The light silver gray color is easily achievable at home with silver gray hair dye – try La Riche Directions “Silver” hair dye for a similar shade. Technically Halle Berry was wearing a wig when she portrayed Storm in the hit movie franchise X Men; but it’s actually quite simple to replicate on your real hair at home. Start by thoroughly bleaching your hair (follow the tips under how to get gray hair at home below) and adding a dab of very light silver gray. Storm has had both long and short hair during different movies in the franchise, so you have plenty of inspiration for how to style your new dark gray hair! If you’re not sure which shade of gray to go for, fear not. Keep reading to discover the best permanent, semi-permanent and temporary gray hair dyes. Finding permanent silver hair dye isn’t rocket science, just look at how many top brands at Dye My Hair have different shades available! Browse the best of the best here. Crazy Color. 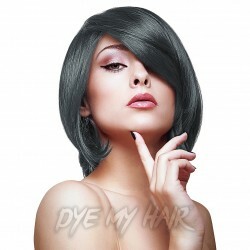 The darkest shade of dark gray hair dye color from Crazy Color is Graphite. It’s a deep, dark shade that reminds us of charcoal. You’ll want to use a dark silver hair toner to keep this shade shiny and deep. Crazy Color also have Platinum and Silver shades; Platinum has hints of bleach and is very pale while Silver almost has a tint of cold blue. La Riche Directions. 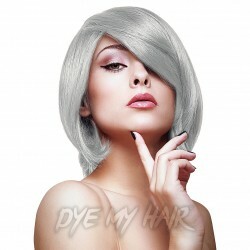 Currently La Riche Directions have the lightest of all silver gray hair dye colors, called simply Silver. This hair dye is conditioning and gentle on your hair, which is perfect if it’s a little damaged from previous dying or bleach. Herman’s Amazing Semi-Permanent Hair Colour. There are 3 shades from this hair dye brand, each named after a granny! Gilda is the lightest permanent silver hair dye (although no way near as light as La Riche Directions), followed by Sylvia which is a mid-dark gray color, and finally Mathilda, a very dark gray hair color that’s verging on black. Stargazer. If you’re looking for a good gray hair toner, look no further than Stargazers Silverlock hair toner for dyed gray hair. An essential buy with your other gray hair products! Paintglow. The only gray hair shade available from Paintglow is similar to Crazy Colors Silver shade, with that lovely tint of dark, metallic blue. 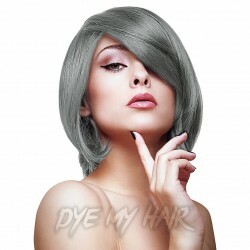 Called Silver Storm, Paintglow’s dye is an unforgettable dark gray hair dye color. Finally, lets talk about temporary hair dyes. Perhaps you just need a wash out color for Halloween night or a tester patch to see if the color suits you… Luckily, Manic Panic have just the thing you need. We definitely recommend trying their Stiletto temporary styling gel. Besides waiting a really long time, you can get beautiful silver gray hair dye to use at home for perfect dark gray hair every time. Follow this method and you can’t really go wrong. Apply bleach: it’s very important to bleach your hair before even attempting to dye your hair with dark gray hair dye.Any hint of your natural color will muddy the gray color, ruining the look completely. Follow instructions: carefully follow the instructions on the bleach and dark gray hair dye. Don’t assume it will be the same as the hair dye from another brand! Test patches are essential too. Use gray hair toner: by using gray or silver hair toner, not only do you reduce the bright reds, browns and coppers found naturally in our hair but you also ensure that the permanent silver hair dye lasts for much longer. Touch up roots: the gray hair toner will certainly help to reduce the appearance of roots and strands of hair you may have accidentally missed, but it’s still necessary to touch up the roots when your hair dye begins to fade. Look after your hair:dark gray hair color needs to be looked after. Use protein and keratin rich hair products (from the same brand as your hair dye if possible) to strengthen your hair and help it to hold onto the color for longer. With careful preparation using the best gray hair dye from Dye My Hair, we’re confident you’ll have modern, elegant dark gray hair that even your grandma will be jealous of! Silver hair; proving that gray isn’t just for your granny! Once upon a time, having a few gray strands was a sign that you were past your sell-by date. These days, though, silver blonde hair dye is being hailed as the new hair trend to be seen with; women around the country are rushing out for a fast track pass to gray hair days! So, what is it about silvery blonde hair that’s so enchanting? Keep reading while we give you the lowdown on all things silver blonde hair! Considering going for a platinum silver hair color but need a bit more inspiration? Let the shiny tones of these celebrities’ gorgeous silvery blonde hair colors do the talking for you! Lady Gaga: Always quick to jump on the wagon of a new trend, Lady Gaga debuted her platinum silver hair color back at the Grammys in 2015. Her long, tousled waves screamed old school glamour and the lilac undertones complemented her fair complexion perfectly. Kim Kardashian: Kim Kardashian’s no stranger to shocking the world and she did just that when she revealed her platinum silver hair color. Rather than dipping a toe in, she dived into the trend with waist long icy hair, but we think she definitely pulled it off! Rihanna: Rihanna’s flirted with silver blonde hair on a few different occasions over the years. Whether she’s gone for a lilac, silver and blonde blend or a black and silver ombre, she’s always lets her ashy tones shine. Cara Delevingne: Let’s be honest, The UK’s favorite fashionista is always giving us style envy and things were no different when she revealed her silver blonde hair. Whether she’s rocking a bob or letting her long locks hang loose, she really is the undisputed queen of cool! All-over Platinum Silver Hair Color: For the ladies who want to go bold, you can’t get more daring than an all-over platinum silver hair color. This shiny looks suits cool skin tones and can be achieved using a silver gray hair dye. Silver with a Touch of Lavender: Who would have imagined a good old fashioned blue rinse could look so modern? To achieve silver hair, you need to eliminate all the warm tones from your hair and let your cool tones shine through. Conveniently, the only shade cooler than silver itself is lavender which, we must say, is a pretty cool color in both aspects of the word. Plus, it looks great with silver hair. Black and Silver Ombre: A black and silver ombre will definitely turn heads without being too drastic a change. If you’re a natural brunette and don’t think you’re ready for a full head of silver hair, this is the look for you. It’s a lot more unusual and futuristic than the usual caramel balayage but still easy enough to achieve in one sitting. Silver Hair with Dark Roots: On the drastic scale, silver hair with dark roots is a step somewhere between an all over platinum silver hair color and a black and silver ombre. While your silver hair shines with opulence, your dark roots will accentuate the color even more. We’re sure that lazy girls will love the excuse to grow their roots out, too! With an extra bit of care and attention, a silver blonde hair dye color can be easily achieved at home by following our tips for dying hair silver. In the weeks leading up to using your silver gray hair dye, be sure to deeply condition your hair on a regular basis. For a gorgeous color, your hair needs to be in a great condition. On the big day, apply Vaseline to your neck and hairline to protect your skin from stains. Separate your hair into quarters or sixths, depending on its thickness and get all the things you’ll need. We recommend wearing old clothes and using old towels when using your silver blonde hair dye. If you want to use a mixing bowl and brush, make sure you have these things to hand, too. Before you use your silver blonde hair dye, you’ll need to bleach your hair to a shade that’s lighter than the tone you want to achieve. We recommend using Crazy Color Bleaching Kit Volume 30 for an all-over color. If you’re only bleaching the ends of your hair or applying highlights, it’s fine to use a stronger bleach like La Riche Hair Lightening Kit Volume 40- just be sure not get this extra-strong bleach close to your scalp, though. Always follow the instructions on your individual bleach kit and be sure not to leave it on for longer than recommended. Before applying the dye to your hair, you’ll need to apply a silver hair toner to remove all the unwanted yellow tones. After using it, your hair should be cool, ashy and ready for the silver gray hair dye. Now for the fun bit- getting the color just right. After you’ve chosen the best gray hair dye for the look that you want, follow the instructions on the box and let it develop. For a uniform color, it’s best to add the color evenly to each section of your hair using a dying brush. Not ready to take the leap? If your hair’s already blonde, you might want to experiment with a silver blonde semi permanent hair dye and then go all the way after you fall in love with the enchanting color. Silver hair can require some upkeep so be sure to follow these aftercare tips for dying hair silver. Use a sulfate free shampoo and conditioner to prevent the color from stripping. Rinse your hair with cold water to lock the color in. Use a purple silver hair toner shampoo to eliminate yellowness. Keep your hair moisturized to lessen bleach damage. So, what do you think of silver hair? Is it just for the grannies or is it an ultra-modern look that’s totally on trend? We’re in the latter camp and love the magical shine of silver hair. There are so many looks that you can achieve with it and it always stands out from the crowd! The Stargazer Hair Colour Toner in Silverlock is sure to give you the light grey or silver hair look you've been craving! Perfect for lightening your hair in preparation for brighter colours! Achieve a sharp and sophisticated look with this metallic shade of Crazy Color Semi-Permanent Hair Dye in Silver! The metallic shades of the Crazy Color Semi-Permanent Hair Dye in Platinum is certain to give your look a whole new edge! Get the hair color of your dreams with the help of Herman's Amazing Semi-Permanent Hair Toner in Blanc Blache! Get the glamorous 'granny hair' of your dreams with the Herman's Amazing Semi-Permanent Hair Color in Sylvia Silver! 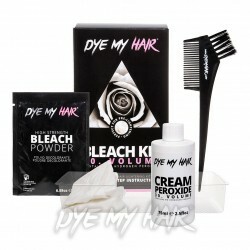 This handy Dye My Hair Bleach Kit provides you with all the tools and guidance you need to bleach your hair at home! Get your hair a few shades whiter with the Manic Panic Amplified Semi-Permanent Hair Dye in Virgin Snow Toner! Perfect as a white dye or hair toner! Show everyone how stylish you are and pick up the La Riche Directions Semi-Permanent Hair Dye 4 Pack in White! Inject some silvery shimmer into your tresses with the sleek and chic Crazy Color Semi-Permanent Hair Dye 4 Pack in Silver, the perfect way to get an on-trend look this season! Get a look to dye for with the La Riche Directions Semi-Permanent Hair Dye 4 Pack in Silver! If you want to try out the gorgeous "granny hair" trend, look no further than the Crazy Color Semi-Permanent Hair Dye 4 Pack in Platinum, perfect for achieving stunning silvery locks! Become a trendsetter with Herman's Amazing Semi-Permanent Hair Colour in Mathilda Granny Grey! If you’re interested in keeping ahead of the rest when it comes to hair dye trends, then it’s definitely worth considering silver hair dye! People are beginning to realize how many great looks can be achieved with gray long hair, so why not join them and become a silver stunner? Whether you’re a natural blonde, brunette or redhead, we understand how easy it is to get tired of your natural hair color. Maybe you’re looking for a change but the more mainstream hair dye colors choices like blue, purple, green and yellow just aren’t your thing? That’s where silver comes in... Whatever shade of gray hair color dye you choose – light gray, dark gray, silver gray– you’re sure to get a look that positively shines! Silver Hair Dye Is Here To Stay! Obviously gray color hair dye has been around for a long time, because, well, our hair goes gray naturally! While there are some famous silver foxes out there who have been around for a while, like Robert De Niro and George Clooney, it’s only recently that gray has been reclaimed as a hair color. For a long time the color gray has been associated with blandness and gloominess, and only recently has it been transformed into a beautiful silver blue hair trend. Though there are incredible amount of celebs out there who have embraced their dark gray hair color in admirable ways – Diane Keaton always look fantastic – there are arguably just as many who have embraced silver hair through dying. Rhianna, Lady Gaga, Zayn, Kelly Osbourne... All of these awesome celebs have gone the way of gray over the past few years – and voluntarily! Ellie Goulding was one of the first celebrities to kick start the silver hair dye trend, rocking it on the red carpet a few years ago. Ever since everyone has been going crazy for temporary silver hair dye! Many have seen the rise in popularity of gray hair as a feminist statement; a way of showing that women can look great with platinum silver hair dye as well as men (who are frequently seen as distinguished ‘silver foxes’). And we have to say that we really are in the age of gray! There’s no doubt that silver has looked drop dead gorgeous on every celeb from Kate Moss to Zosia Mamet. As these celebrities show, we should all embrace gray hair instead of trying to cover it up! A Look To Dye For! Silver is often seen as one of the more difficult hair colors to achieve, but as long as you’re willing to put in the time you shouldn’t have any issues! And before you worry, it is possible to get silver hair treatment no matter what your natural hair color is. Here’s a step by step guide to getting the silver look of your dreams... Getting gray hair at home isn’t difficult as long as you’re committed to doing it right! Due to the light coloring of silver hair, to get the best look it’s really important to bleach your hair beforehand. This will stop your natural hair color from clashing with your silver hair dye, making sure you get the shade you really want. Next, it is important to use a purple toner to help cancel out any remaining unwanted color. Silver toner for hair is particularly a great way to remove any unwanted shades of yellow and orange– making it especially important if you’ve recently dyed your hair another color! This will allow you to get the absolute best color results when giving yourself white or silver blue hair. If you’re worried about using toner for the first time don’t forget to perform a patch test on your hair to see how the toner will take to your hair, and proceed accordingly. Now it’s time to apply the dye! Apply it from the root upwards using a brush, ensuring that your hair is colored in an even fashion. Once you get your hair just how you like it, you’re all done! It’s worth mentioning that sometimes the tone can initially appear to be light blue or lavender, but this normally calms down after a couple of days. If you’re totally in love with your new color then be aware of how to prolong your new silver hair color for as long as possible. If you’ve chosen semi-permanent hair dye, be aware of its duration. This can be a number of weeks but can also depend on how much your hair is washed. To prolong the your ravishing look make sure to only use specially formulated shampoo in order to nourish your hair and lock in that new color! Finally, if you don’t think your look came out quite how you wanted it or, or you have some lingering questions; don’t be afraid to ask for advice from a hairdresser or stylist! We’re eager to help you get the color you want, whether it be a shimmering silver or a slick looking shade of gray. If you’re looking for a silver with some shine to it, why not give the Crazy Color Semi-Permanent Hair Dye in Platinum a go? Or if that’s not your thing, why not take a look at the Manic Panic Dye Hard Hair Styling Gel in Stiletto? Getting a fresh look has never been so easy.